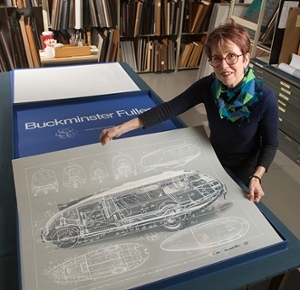 The legacy of legendary 20th century architect and inventor Richard Buckminster Fuller will take on even larger life at the Center for Spirituality and Sustainability (CSS-Dome), located on the campus of Southern Illinois University Edwardsville, with the donation of a portfolio of the artist’s prints. The Estate of Buckminster Fuller and Allegra Fuller-Snyder (Fuller’s daughter) donated “Twelve Around One” to the CSS, which Fuller designed. “As an artist, inventor, visionary and designer Buckminster Fuller epitomized whole-systems thinking. His approach to science and technology’s connection to art and culture is a forerunner of the concept that we now define as STEM subjects (science, technology, engineering and math) and make it STEAM (science, technology, engineering, art and math). “The donation was a way of honoring the good works being done by the Center on the SIUE campus,” said Benjamin Lowder, creative consultant at Fuller Dome SIUE and board member on the Fuller Dome Home at Southern Illinois University Carbondale. Lowder and Vigneau-Dimick have written a grant proposal for a Meridian Award seeking funding to frame and display the prints, which are expected to be hung in November, according to Vigneau-Dimick. As the largest college on SIUE’s campus with 24 distinct departments and areas which encompass science, art and culture, the College of Arts & Sciences has a particular affinity to Fuller’s interdisciplinary aesthetic. “The prints themselves demonstrate mastery and futuristic thinking combined with whimsy and beauty. The 30”x 40” multilayered prints contain diagrams and photographs in varying combinations of grey, black, white and blue, bringing to life the man, his vision and the manifestation of many of his accomplishments. It is our hope that students can come away from the experience with a sense of possibility and a connection to his thoughtful and generous mind.” Said Vigneau-Dimick. Having the portfolio here for students and scholars to engage with allows the Center for Spirituality and Sustainability to partner with the University Museum to demonstrate the multi-functional and beautiful aspects of Buckminster’s designs through programming that will be available to all kinds of groups on campus and in the surrounding community. A number of Fuller domes are located throughout the Midwest region beyond Edwardsville including Carbondale and East St Louis. “I hope that by displaying these prints, and having co-curricular activities and information to go along with them, it will make people more aware of a bona fide genius, who was a part-time faculty member at SIUE, although he had a full- time appointment at (SIU) Carbondale,” said Stack.